The food festival in Skibbereen was great as usual and as usual was blessed with unseasonally fine weather. I took lots of pics at the fair on Sunday but there were many more fine sights to be savoured like the fabulous creations of local students in the schools cookery competition or the spread of cakes at the afternoon tea session at Stories from the Soil, Stories from the Sea. Indeed the breakfast and lunch sessions of that event were at least as sumptuous, and at all three there was a great reaction to the speakers – Elke at Dine & Wine Club Cork has more. Among the interviews that have really stuck with me in the last year of writing this column, have been those involving a relationship between farmer and farm animals. So when I looked at the programme for the An Sanctóir food event, one talk that really piqued my curiosity was that on Working Horses by Sandra Schmid. Sandra lives with her husband Tim Rowe, in a fantastic eco-house in a sheltered glade in the Ouvane Valley near Ballylickey. Tim is a full-time beekeeper and is also speaking at An Sanctóir. They have a small holding of 5 acres with a few more rented but are not farming commercially, being content for now to produce a large proportion of their own food. 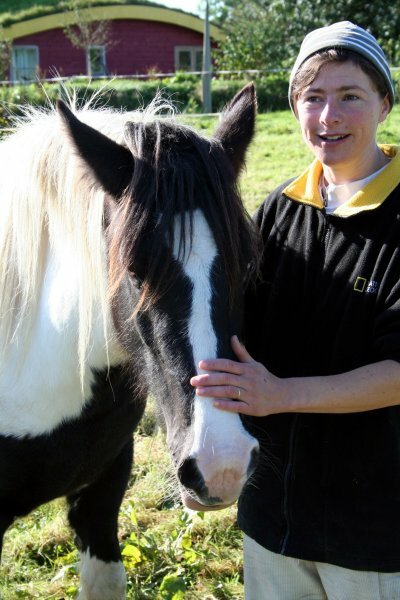 Sandra is still learning about farming with horses but is convinced that they have a valuable role to play for some small farms, particularly as the cost of fuel and fertilisers continues to rise. “We have two Irish cob horses, which people would know as a type of horse developed by Irish travellers. They are smaller than Continental and English work horses, but still have the short back and musculature of a workhorse. They’re more suited to working on a small farm like this and pick their way between potato ridges. They have a very grounded temperament and will stay pulling all day.” The Irish Cob is not strictly a formal breed and as such there are no records of bloodlines etc. They were developed for pulling caravans and as such are also ideal for most farm work. Without farm work, however, the workhorse characteristics they have developed are being diluted. With their placid temperament, cobs are now being interbred for use in riding schools, the resulting animals are taller and have longer backs for more comfortable riding. There was a time in Ireland when we would not have countenanced lifting a morsel to our mouths without first giving thanks to the Creator for the gifts we had received. It was understood that life was a miracle and as such food was a gift from above, in which God blessed our toil in the fields. Now don’t worry, I’ve not fallen under the entrance of campaigning creationist Sarah Palin, more simply my point is that we no longer view food as a gift from something greater than ourselves. This is not just a sentimental loss but is also a fundamental danger when we turn the tables and start to play god with nature. The God complex is nowhere more evident than in the science of genetics, particularly genetic modification, the dangers of which have been well spelled out and thankfully for now kept from our door. Just 2 weeks ago at the Terra Madre Ireland conference in Waterford, Minister for Food, Trevor Sargent, gave a solemn promise that Ireland will remain a GMO free country. The real agenda behind genetic modification (GM) is not simply the worthy desire to produce a superior product but is actually to grab ownership of the means of production itself – the seed. Monsanto, which has 90% of the GM-plant trait patents, doesn’t need to own all of the world’s agricultural land if instead it can effectively charge a rent on land use through seed patent monopolies and the prohibition of seed saving by farmers. There is a small but growing movement to protect agriculture and biodiversity from this scenario by spreading and improving the practice of seed saving. Madeline walked me through her seed gardens, introducing me to her plants. Many of these are the result of years of refining and improvement through careful recording and selection. At this time of year, the gardens have a wonderfully wild and outlandish feel. So many of the plants change form when they run to seed, stalks shooting sunwards as the leaves recede, tubers, pods and seed heads all ready to burst and disperse. Ordinary garden vegetables like the carrot plant were to me unrecogisable in their fertile form. August this year marked the tenth anniversary of Growing Awareness, a Skibbereen based food and farming group and on Sunday next (September 28th) they have partnered up with An Sanctóir, the holistic centre in Ballydehob, to put together a day of walks, talks and demonstrations looking at local food production. The guided walk will take in the An Sanctóir’s ‘Nature Trail’ which supports a wide variety of wildlife and habitat areas, and will finish in the new Forest Garden Project begun this spring. The full days’ programme will include a selection of speakers, demonstrations and activities on topics such as: Beekeeping; Working Horses: Community and Schools Gardens; Allotments and Vegetable Box Schemes; Fruit and Nut Growing; Basket Making; Seed Saving and much more. Gardeners are invited to come along and enter the Heaviest Pumpkin and the Largest Diameter Sunflower Head competitions. You can enjoy the on site Cafe from the deck of a 40ft Pirate Ship whilst being serenaded by local musicians! People are also welcome to bring a picnic. The Café will be raising funds towards the running costs of the event and there will be no admission charge. 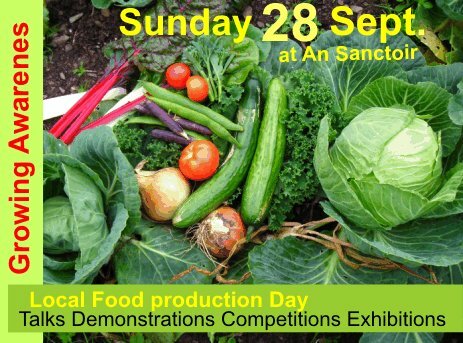 For the full schedule of events visit www.ansanctoir.ie. For my column this week I took the opportunity to find out a bit more about 2 of the individuals who will be presenting on the day and learn something of their involvement in the food culture of West Cork. On Sunday September 28th we have been invited to West Cork to visit Paul and Yvonne Johnson’s Dexter girls.These horned cattle are the first herd of pedegrees to be to be reared in their native West Cork for generations.Just 42 inches in height they are one of the smallest breeds in the world.Paul farms with his eyes and ears.No additives or feeds are used.They grow the natural way,hence the better quality tender meat. Stephen and Sarah Canty of Food For Thought, are supplying a sumptious West Cork Picnic,with all local good clean and fair produce. Please let me know if you would like the vegetarian option. Wines from our very generous sponsors Febvre and company. Bookings, Simone at Interior living,11 Mac Curtain Street, tel 4505819 from10am to 5.30pm,Mon to Sat. I shall assist with directions at time of booking. If you’ve enjoyed any of the posts from this blog, then I can wholeheartedly recommend the Stories from the Soil, Stories from the Sea eating sessions on Friday 19th September in Skibbereen. The event is being organised by ourselves at West Cork LEADER Co-op and is part of the Taste of West Cork Food Festival. We’ll be sitting down to on three occasions during the day to dine on local seasonal food and listen to the personal stories of 2 local producers at each sitting. Diane Curtin will be on hand to guide diners and introduce the speakers. 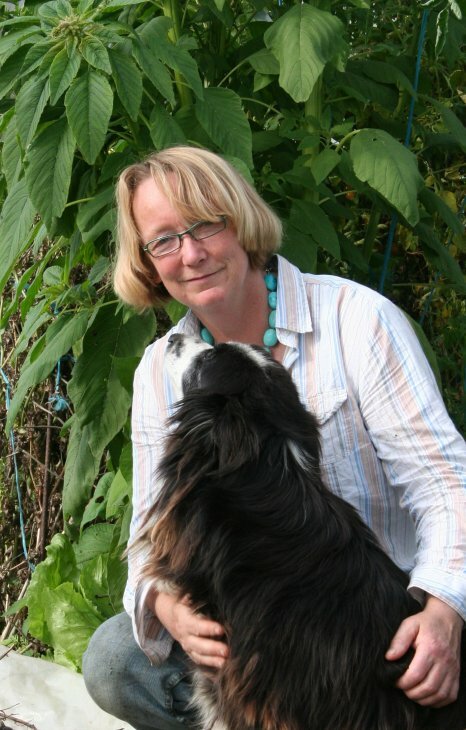 Diane is a journalist and chef and is deeply involved with food in West Cork, particularly through Slow Food. She recently published her own book The Creators, which combines the life stories of farmers and food producers in West Cork with enjoyable recipes. The breakfast session focuses on fish and we will hear from Sally Barnes of Woodcock Smokery and Frank Fleming, a fisherman from Crosshaven. Sally is one of Ireland’s most highly acclaimed artisan producers and has been smoking fish in Castletownshend since 1981. She has an unswerving commitment to producing the very highest quality food. Like everyone else involved in seafood though, her business has had to cope with turmoil and uncertainty. Frank Fleming has been fishing with his brother Martin for 24 years. They concentrate largely on catching prawns. Frank has strong views about the future of fishing and is committed to finding positive solutions to many of the industry’s current dilemmas. Lunch will have a bovine theme with talks from Paul Johnson of the Traditional Meat Company and Bill Hogan of West Cork Natural Cheese. Paul rears Dexter cattle on his farm near Dunmanway. Dexters are a rare breed of cattle native to this part of Ireland and as such are uniquely well adapted to live in harmony with our environment. Bill Hogan is one of our foremost cheesemakers, he and Sean Ferry produce Gabriel and Desmond Cheese. Bill is a real champion for the small producer and the importance of food for rural areas. The final session of the day will be afternoon tea, a chance to enjoy some very fine baking and patisserie with Jean Domican from Buns ‘n Stuff in Macroom. Jean will be joined by food historian Diarmuid Ó Drisceoil, who besides writing the fascinating history of Cork’s English Market, also spins a great tale. Places for each session are limited so I would advise booking early by calling West Cork LEADER Co-op at 023-34035, tickets cost €15 per person. The Stories sessions will be followed at 5pm by the launch of a new food map of West Cork by West Cork LEADER Co-op. The map presents the area as a photo montage of food and is bursting with colourful images of cheeses, fish, fruits, cattle and fowl. The map will be used by local retailers promoting food from West Cork and will also be available to local schools as an educational resource. As part of the launch I have been asked to present some of the stories from my Food Culture column. This is a free event, so come along if you’d like to hear more about the people I’ve met in researching this column and the part they play in creating such a thriving food culture in West Cork.